Political Risks in Import Export Business. 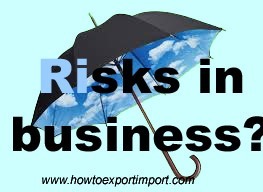 What do you mean by political risks in export and import business? How does political risks affect exports and imports? In this article I am going to explain about the political risks involved in import export business and solution to handle political risks under export import trade of international business. Let us discuss about the factors involved in political risks. What are the causes of political risks under an international business? One of the major factors under political risks is the change of policy of new government in each country. As we know, in most of the countries have ruling and opposition parties. When a new government is elected and the opposition party comes in to force, the policies of opposition party could be changed. These changes include import export policy and foreign business relationship with other countries. Many countries have cold war with other country, either with neighboring country or with other countries. There could also be a war (other than cold war) which seriously effect the trade relationship due to heavy risk in trade. Other than war between countries, there are chances of coups, rebellions and civil wars. Civil wars, coups and rebellions also leads to disturb peace of a country which affects trade between countries. How to avoid political risks under Export Import trade of International Business? Up to some extent, political risks can be minimized by updating the status of dealing country’s day to day movements through communication. The political risks under export import trade also can be avoided by judicious selection of the countries to which goods are exported or imported. The major threat is that most of the insurance companies do not cover political risks under the insurance coverage under normal insurance premium . However, those insurance companies cover political risks with high premium of insurance. There are credit risks covering insurance companies who also protect insurance coverage against political risks under export import also. I hope, you have enjoyed reading about political risks in export import trade and how to solve political risks in international business. Would you like to add more information about political risks in international business ? Share your experience in resolving political risks in import export business. Comment below your thoughts about political risks and solutions under import export business of international trade. How to prepare Export Invoice? What are the legal documents in Exports? Why does Documentation require in Exports and Imports? How to protect Buyer and Seller in Triangular Exports and Imports? How does High Sea Sales work in Exports and Imports?